Rabīʿ al-Awwal (ربيع الأوّل) is the third month in the Islamic calendar. During this month, many Muslims celebrate Mawlid - the birthday of the Islamic prophet, Muhammad. Although the exact date is unknown, Sunni Muslims believe the date of birth of Muhammad to have been on the twelfth of this month, whereas Shi'a Muslims believe him to have been born on the dawn of the seventeenth day. The Prophet himself never celebrated the mawlid, instead encouraged Muslims to fast on Mondays of every week due to his birthday being “on a Monday”. The name Rabī‘ al-awwal means the first [month] or the beginning of spring, referring to its position in the pre-Islamic Arabian calendar. Hence this is considered to be a very blessed month. Meaning The word "Rabi" means "spring" and Al-awwal means "the first" in Arabic language, so "Rabi' al-awwal" means "The first spring" in the Arabic language. The names seem to have to do with the celebration events in the month as "spring" is the end to winter (symbol of sadness) and consequently the start of happiness. The Arabic calendar being the lunar calendar, the month is naturally rotating over years and Rabī‘ al-awwal can be in spring or any other season every now and then, so the meaning can. not be related to the actual season. Celebrations Although historians and scholars disagree on the exact date of Muhammad's birth, it is commonly celebrated on 12th or 17th of Rabi' al-awwal. The celebration of the Mawlid is done differently depending on the country. In some areas, celebrations begin as early as the first of the month and can continue till, the end of the month. Muslims generally put colored lights on roads, streets, and their homes and put green flags as well to celebrate. 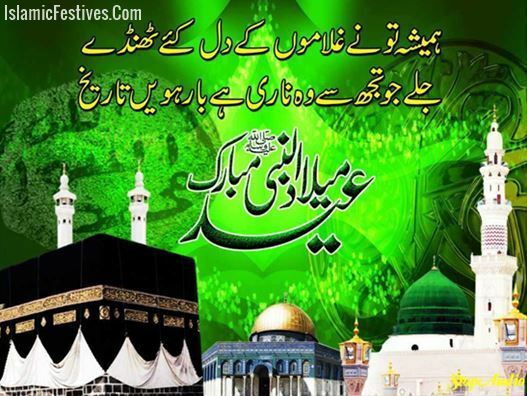 In many countries, a procession is also conducted on 12th or 17th of Rabi' al-awwal night and day. On these occasions, sweets and drinks are also distributed widely from home to home and to the general public. In some areas Muslims also exchange gifts. It is the month of blessings. The week including 12th and 17th is called Islamic Unity Week in Iran to address both Sunni and Shia views on the birth date of Prophet Mohammad. Hadith There will be an Ayah (sign) in (the month of) Ramadan. Then, there will 'Sabah (splitting into groups) in Shawwal. Then, there will be fighting in (the month of) Dhu al-Qi'dah. Then, the pilgrim will be robbed in (the month of) Dhu al-Hijjah. Then, the prohibitions will be violated in (the month of) al-Muharram. Then, there will be sound in (the month of) Safar, then the tribes will conflict with each other in the two months of Rabi' al-awwal & Rabi' al-Thani. Then, the most amazing thing will happen between (the months of) Jumada and Rajab. Then, a well-fed she-camel will be better than a fortress (castle) sheltering a thousand (people).